EfV is the kind of girl who trims the mold from her bread and then toasts it up without a care in the world. And when it comes to eating out, things can get much more extreme. If the tacos smell good, I ignore the tired-looking rag being used to wipe a cutting board. If the noodles are expertly hand-pulled, I place my trust in the hands that are pulling them, even if they recently stubbed out a Camel Light. I have been employing such tricks of denial for years, and you know what? The only time I got really sick from eating out, it was a questionably trendy Meatpacking District salad. But the debate comes up often over dinner with the family: you see, my lovely sister has spent her working years in kitchens and in restaurant management. She has seen what I have taken pains to block out, has learned the science of food-born illnesses, and emerged somewhat traumatized. There are places where she just won’t eat anymore, and as I gnaw the curried goat meat off a bone, I am always thankful that I don’t totally understand why. Recently, I said “I’m sure if I knew as much about this stuff as you, I’d be grossed out too.” Well, folks, she is taking me up on this hypothetical challenge. 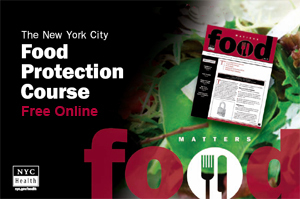 The Department of Health, which went on quite the restaurant inspection rampage this year, is currently offering a free, online version of its Food Protection Course. And guess who’s signing up? If you want to play along, please join me, and if/when we pass the final exam, we’ll see whether we’re willing to celebrate in Chinatown.